"The Fun Place to Brew Your Own Beer and Make Your Own Wine!" 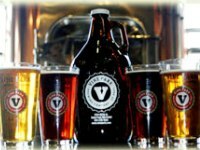 Vine Park is a unique brewery - the only brew-it-yourself-on-the-premises in the Midwest. Having just celebrated its 12th anniversary being the Fun Place to Brew Your Own Beer & Make Your Own Wines. We hope you will join the thousands of happy customers who take home to share with friends & family the beer and wine they have handcrafted here. It's a state-of-the-art facility where customers enjoy making their own ales, porters, stouts, wheats, lagers, pilsners and bocks. Now wine lovers can also make their own white zinfandel, chardonnay, cabernet sauvignon, shiraz, and merlot. River City Root Beer is available exclusively at Vine Park Brewing Co. Our root beer is hand crafted in small batches using locally produced honey and other secret ingredients. Monday Beer Making Brew your own beer! Wine Making Make your own wine! Tuesday Beer Making Brew your own beer! Wednesday Beer Making Brew your own beer! Thursday Beer Making Brew your own beer! Friday Beer Making Brew your own beer! Saturday Beer Making Brew your own beer!